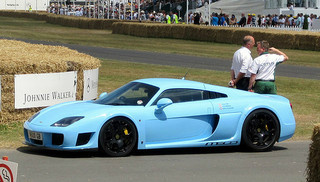 The Noble M600 sports car was launched at the Goodwood Revival Meeting in late 2009, and was the successor to the well-received M12, and the more aggressive M400. It was offered as a two seater fixed head coupe, with a price tag of £200,000, and planned production of only 50 units a year. The body consisted of a lightweight composite fibreglass construction attached to a steel space frame chassis, which produced a curb weight of 1250 kg. ABS and traction control were offered as optional extras in order to maintain the weight-saving minimalist approach of the standard car. Although it was popular, the M12 was fitted with a transverse engine which, as the power output of the twin turbo unit increased as a result of ongoing development, this created a number of problems related to insufficient cooling and gearbox reliability caused by ever-increasing stresses. However, these problems were overcome in 2006 with the launch of the Noble M15 which was fitted with a longitudinally positioned engine, and this format was continued in the M600. In terms of performance, the car was pitched in that market sector dominated by the likes of the Porsche Carrera, Ferrari Enzo, Bugatti Veyron, Lamborghini Gallardo and McLaren MP4/12C. 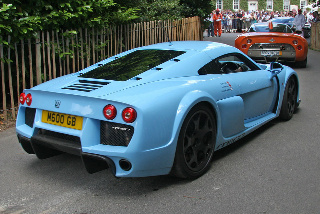 The M600 was designed and developed with the aim of ensuring that the driver, and not an array of electronic computer-controlled aids, was in complete control of this impressive sports car. In 2013, a variant of the original M600 was introduced, and designated the Noble M600 Carbon Edition. It was offered with what was, in fact, a "bare" carbon fibre body which contained a tinted translucence. The new finish had taken much painstaking work to perfect, and the result was impressive. In each case, the redline was 7000 rpm. Fitted with a Graziano six speed manual gearbox, and a compression ratio of 9.5:1, it produced a top speed of 225 mph, a 0-60 mph time of 3.0 secs, and 0-100 mph in 6.5 secs.